Posted on January 4, 2012 by Susan H.
My father-in-law’s parents immigrated from the Ukraine to Canada before he was born. He was raised in Northern Canada on his mother’s Ukrainian cooking, learning to speak Ukrainian along with French and English. 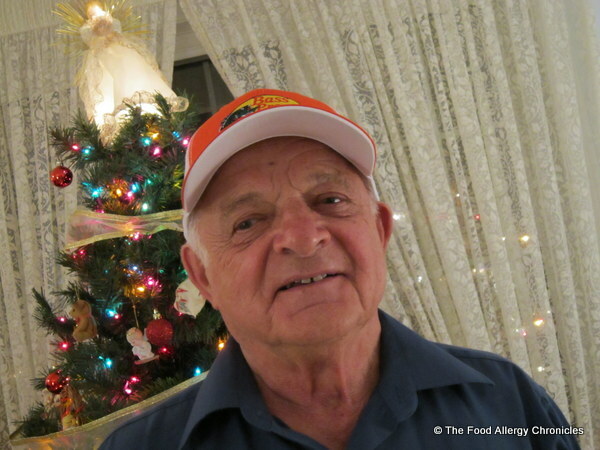 With his parents passing, his ability to converse in Ukrainian waned…however, his love for his mother’s Ukrainian dishes lived on. My father-in-law is the Pierogi King! New Year’s Day found us on the road home from our visit with my brother’s family. We stopped in at my in-laws to wish them a Happy New Year. My father-in-law was busy whipping up batches of pierogies. A sampling was packaged up to add to our supper. Over the years, my father-in-laws pierogies have been the most sought after dish at any family gathering. Not so for my boys…Matthew, who can eat them, wouldn’t and claimed he didn’t like them…Michael, who couldn’t eat them due to his dairy allergy, would look longingly at them, wishing he could try them. It is only just lately, that Matthew’s curiousity has got the better of him and he has been asking to sample a pierogi…much to his delight he has ‘seen the light’ and is now a pierogi convert! All the more reason for me to put my thinking cap on and work out an adaption. Bringing them home that night was yet another reminder…but wait…I could adapt them…what if I used Daiya Cheddar Style Shreds for the cheese and Earth Balance Butttery Vegan Sticks for the butter? The next morning found me out and about picking up potatoes and Daiya Cheddar Style Shreds…I had enough Earth BalanceButtery Vegan Sticks. 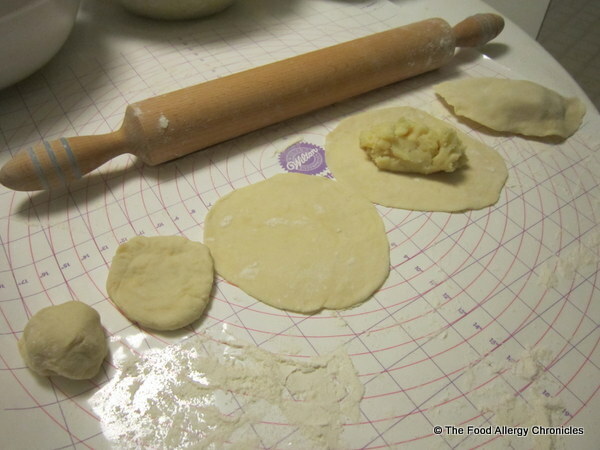 I found a recipe for Pierogy Dough at Ukrainian Classic Kitchen and International Cuisine. 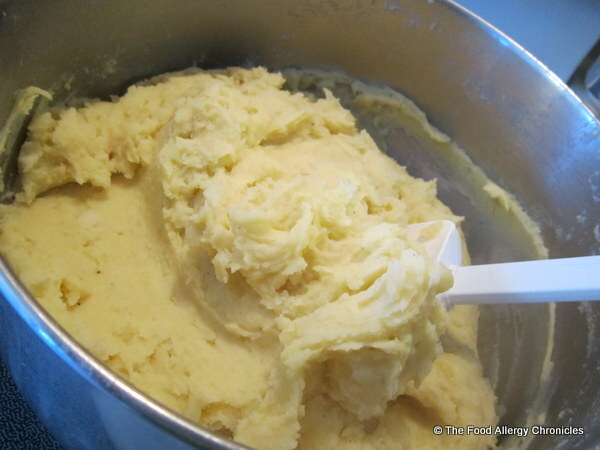 Click here for the Potato Water Dough (8) recipe. I figured out a recipe for the potato filling from what I knew my father-in-law put in his pierogies and the starting point of measurements from a family friend’s Ukrainian family recipe… then just tasted for any adjustments. May I present to you…a thing of beauty…Egg and Dairy Free Daiya Pierogies! Tip: For a soy free version use Earth Balance Soy Free Natural Spread. Tip 1: I kneaded the dough until it was nice and soft and then wrapped tightly in Saran wrap to rest. Thinly slice potatoes and place in a large pot. Fill with water to just cover the potatoes with a 1 tsp of kosher salt. Bring to a boil and let simmer until fork tender. Drain water, reserving 2 cups of potato water in a liquid measure for dough. Mash potatoes in pot. Stir in the Earth Balance and Daiya Cheddar Style Shreds and pepper to taste. Once the dough has rested, take a small tablespoon size of dough and using your fingers, spread out the dough in a circle. Place on a well floured mat and roll out nice and thin. Scoop out a couple of tablespoons of potato filling and place in the middle of the rolled out dough. Pull the dough up and over the filling and seal the dough. Place the pierogi on a floured tea towel and continue. 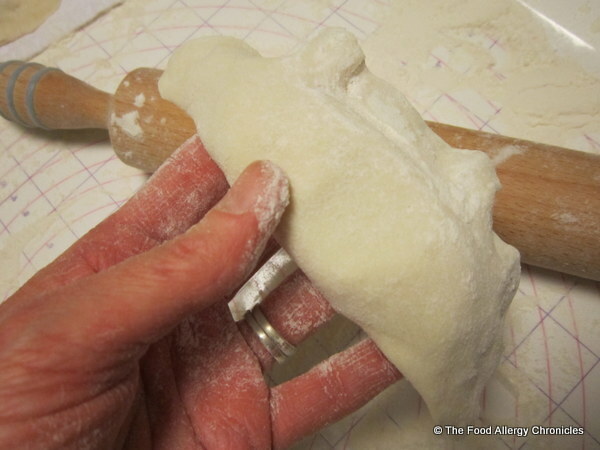 Be liberal with your use of flour…helps with the sealing of the pierogi. Tip 1: Be sure to seal your pierogies well so there will be no leaking of potato filling in the water. Tip 2: Only cook what you will eat that day and the next. The rest can be frozen on a cookie sheet and then transferred to freezer bags. Bring a large pot of salted water to the boil. Add a few pierogies at a time. They have finished cooking when they float to the top of the water. 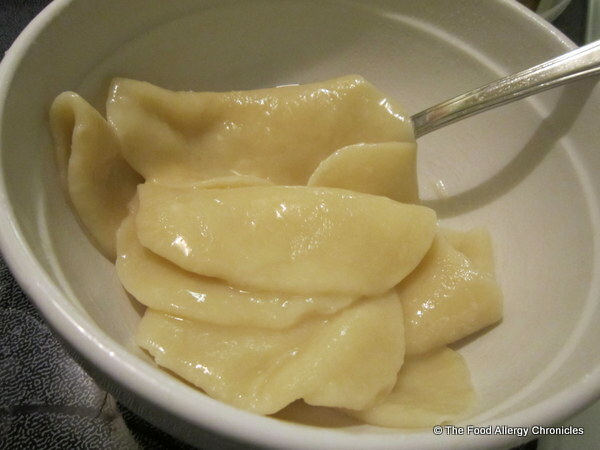 Place in a large bowl with Earth Balance…add enough to keep the pierogies from sticking together…you be the judge. 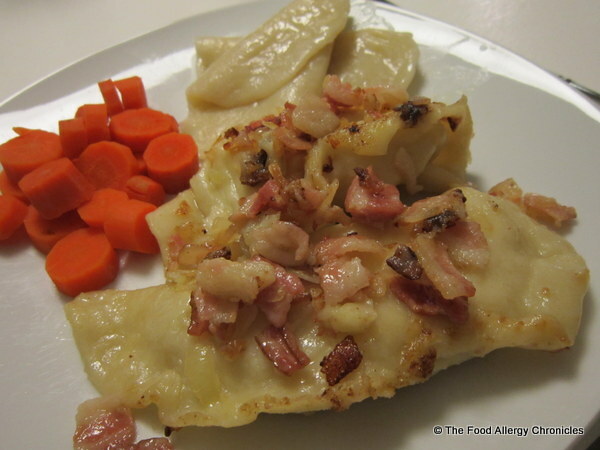 I cooked up way too many pierogies…perfect for leftovers the next night…Bacon and Onion Fried Pierogies anyone? In a fry pan, add 5 slices of diced bacon and a diced small onion. Cook until starting to crisp. 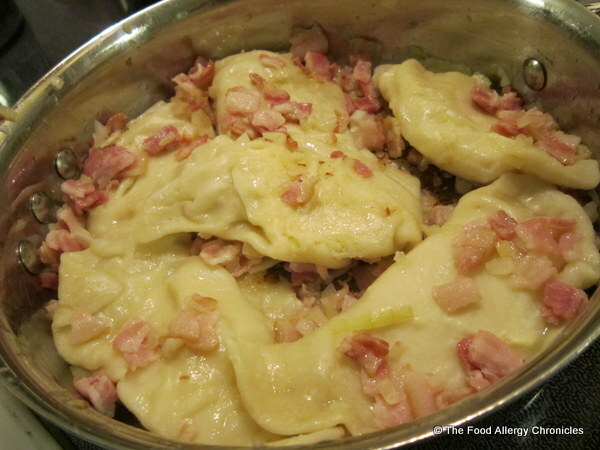 Add in the leftover pierogies and toss to warm up with the bacon and onion. You may need to add a bit more Earth Balance. What do you do with any leftover pierogi dough? My father-in-law would say make…Dough Balls. 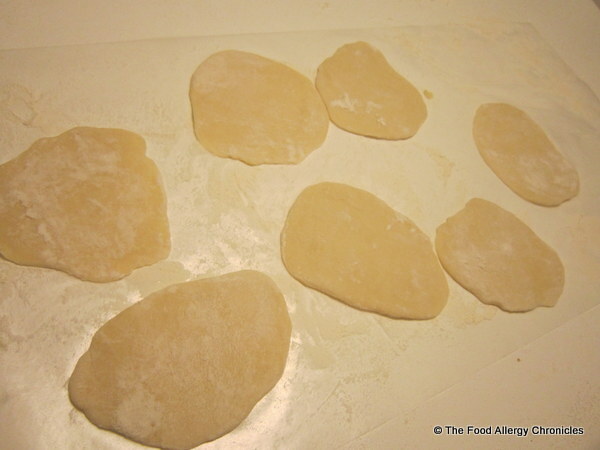 Michael rolled out tablespoon sized dough pieces. Bring a pot of salted water to the boil and toss in all the dough pieces. When they have risen to the top they are cooked. Place in a bowl with Earth Balance and toss to cover. Michael liked the Dough Balls, then the Bacon and Onion Fried Pierogies and then the Original Pierogies. Matthew liked the Original Pierogies, then the Dough Balls and lastly the Bacon and Onion Fried Pierogies. P.S. 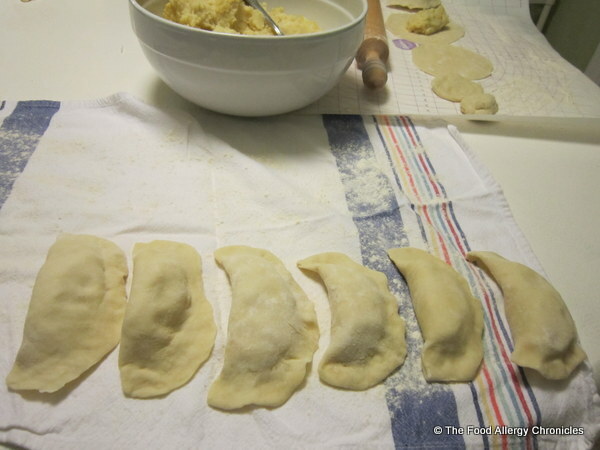 Making Pierogies is very time consuming…but well worth the effort put into them. I made half one day and the rest the next day. 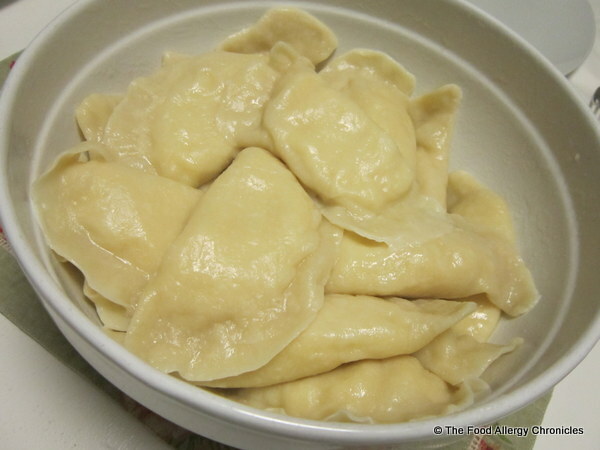 I highly recommend making them at one time…I left the dough out on the counter and it went all moldy…I had to make another half a batch of dough for the rest of the pierogies…those I froze. After discussing my faux pas with my in-laws, they recommended making the potato filling the day before and then the dough and the Pierogies the next…never both and certainly not at the same time as making Cabbage Rolls. Ooops! 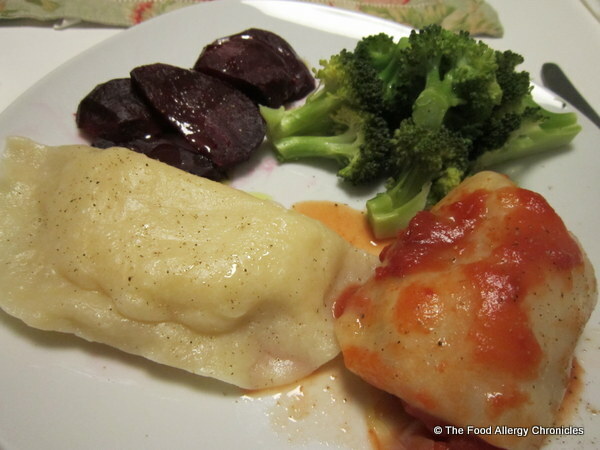 P.P.S The timing for making Dairy Free Daiya Pierogies and Cabbage Rolls is perfect for celebrating Ukrainian Christmas on January 6, 2012. P.P.P.S. Cabbage rolls will be posted on Friday…my mother-in-law’s specialty! Click here for the link. P.P.P.P.S. My in-laws just purchased a Black and Decker Bread Maker in the sales and made their first loaf of bread…they substituted in oil for the fat…a healthy choice. This entry was posted in christmas, dairy free, daiya, dinner, egg free, multiple food allergies, peanut/tree nut free, sesame free, side dish, soy free and tagged dairy free pierogies, Daiya Cheddar Style Shreds, earth balance, egg free dough for pierogies, egg free pierogies, pierogies made with daiya cheddar style shreds, soy free earth balance, ukranian christmas by Susan H.. Bookmark the permalink. Awesome! 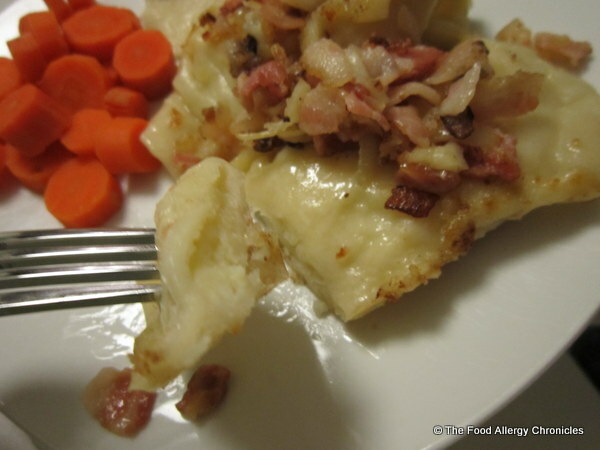 Michael loved the bacon addition…I imagine he will be wanting to do the same with the Dough Ball leftovers! Hi Susan, I am of Ukrainian heritage too… on my father’s side. We just finished prepaing perogies and cabbage rolls in our household as well. My mother is recently allergic to dairy, so she decided to skip the dairy altogether. She simply wanted to try the mashed potatoes with plenty of fried onions and pepper (she likes lots of pepper too!) mixed in with the potatoes. We prepared hers separately. Our dough is very simple: flour, water, oil and salt (I’m sure you have a good recipe, but if you are interested in ours, I would be happy to share it). Well, my mother declared the dairy-free perogies delicious!! She was thrilled to enjoy them so much since we’ve always put loads of cheddar cheese in ours (it used to be dry curd cottage cheese, but we’ve moved to cheddar cheese long ago). For our cabbage rolls, our recipe includes cabbage (of course) and the filling is a combination of ground beef, a couple of slices of cooked bacon, onion, garlic, uncooked rice, salt and pepper (we skip the egg due to egg allergy, and you’d never know it was missing). Our sauce includes tomato juice, lemon juice, brown sugar, salt, pepper and garlic. Yum yum! We had a sampling this past Sunday, but Saturday evening is the big feast at my brothers. We wanted to prepare our son’s (and my mom’s) safe perogies and cabbage rolls in advance. We will bring along safe bread, safe dessert, and any other things we need to. My sister prepares the borsht, and it’s dairy free, so my son and mother can eat it safely. Can’t wait for the feast! Hi Julie! It all sounds delicious! What a lovely Ukrainian tradition for you all! Would love to compare your dough recipe, although I was quite pleased with this recipe. Try the Daiya Cheddar Style Shreds…it gives the peirogi that cheesiness if you feel it missing. I ended up using half of what our friends recipe called for…adding a bit at a time will guide you to the right taste for your family. What is the safe dessert you are bringing for everyone? Perhaps next year you will be preparing safe peirogies, cabbage rolls, bread and dessert for everyone…convert them all! lol Enjoy your feast! 2 year old’s can make for great helpers…the dough is fun to play with…roll it out and make dough balls…yummy! Enjoy! These look incredible, but a lot of work. If I can find a free day sometime, I want to try these out. It would be fun to get my son involved in making them too. I’m sure we’ll have a snow day that needs a fun family activity this year. Thanks again for the Liebster Award! I posted it on my site just last night. 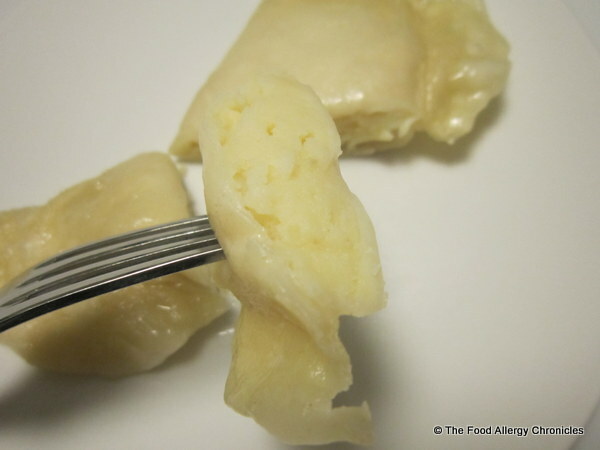 Pierogies are time consuming…but they make so many that you can freeze for easy suppers. Perfect recipe for helpers…they take no time to cook so there is that instant gratification from their efforts. I will definitely be checking out your blog. Fantastic! What a busy day you will have had! we make perogies as well! I would love to know what to do with the leftover Perogy dough. you mentioned dough balls…do you fry these? boil? bake? in butter? would love a recipe please! Hi there! Just boil up the leftover dough rolled in to balls…you can fry them up after with some bacon and onions. My boys love them!